Husband got our first desktop and printer from a raffle during a 1996 trade show in Makati. We were starting a family and buying a new desktop was not a priority so we were ecstatic when hubby brought home the brand new computer and printer. 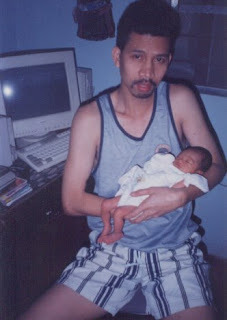 The desktop behind my husband was the same computer that he won during a trade show in Makati in 1996. Hubby said the computer trade show attended by luminaries in the IT industry features the different computers and laptops and other cool gadgets. The trade shows are primarily conducted to show the latest gadget to dominate the market. Trade shows encourage people to buy the product and help manufacturers increase their sales. Aside from the cool stuff displayed in the trade fair, trade show organizers ensure to make the event site presentable to guests by using state-of-the-art trade show displays, truss, logo floor mats, and exhibit booths. Usherettes or receptionists would give away colorful handouts about the different products presented in the trade show; some hand out ball pens and other souvenir in the event. They also conduct raffle activity as crowd drawer. Some trade shows, trade fairs, bazaars and exhibit are held during Christmas season to support important causes and institutions. Products sold here are usually cheaper compared to the regular prize in the market. People usually support this kind of activity for a good cause. This entry was posted in Uncategorized and tagged trade display, trade shows on April 15, 2010 by Yami. Your husband is lucky! I never get to win anything big! LOL! Exchange links din tayo dito ha? I'm placing this blog under my list of "Interesting Sites."